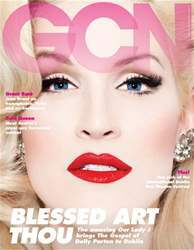 In this issue Lady J talks to Brian Finnegan about growing up Amish, rubbing elbows with buddies Daniel Radcliffe and Lady Gaga, and Dolly Parton paying for her gender realignment surgery. LGBT Drama Group, Acting Out, discuss their new play and the significance of being featured in the Dublin International Gay Theatre Festival. Ciara McGrattan meets lesbians and gay men who have given unwanted dogs a second chance at life, and enhanced their own lives into the bargain.